What was the inspiration/motivation behind the book? I wrote Kicking Eternity because I have struggled, like the college kids and young adults who hang out at my house with my kids, to determine which dreams to pursue. I am intrigued by the “negative” things in our lives that push us toward that daring thing we were created to do. As a young person, I dreamed of living as a hermit on the coast of North Carolina—which I had never seen—and writing. Instead I married and had four kids—and wrote. The hermit thing was a product of how I had been warped by a difficult childhood. The life I got oh-so-much-better suited me. I’ve spent part of every year at camp for most my life—a natural setting for my book. My father spent several years building a forty-foot sailboat in our backyard. We launched it in the Miami River and lived aboard at Dinner Key Marina when I was eleven until I turned thirteen. At the time I didn’t realize how unusual it was to live on a boat and ride my bicycle down the dock each morning to attend school. All my friends at the marina did the same. After school every day, I tossed my books onto my bunk, shimmied into a swim suit, and jumped overboard. 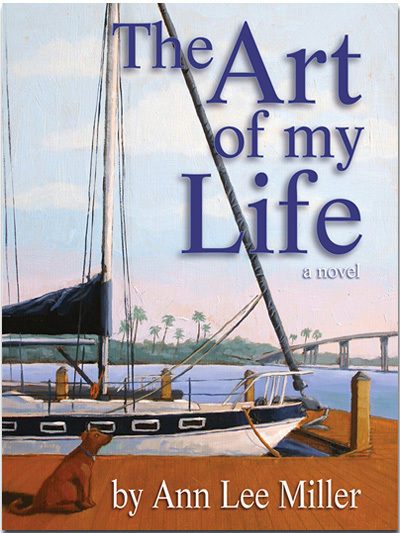 Sailboats show up in all my books thus far. In addition to Kicking Eternity, The Art of My Life debuted in September, Avra’s God will launch in December, and Tattered Innocence next March. Did you spend time in a convent? I attended St. Hugh’s Catholic school in Miami, Florida, as a child, and was invited for a sleepover, along with my best friend, Jody, by our favorite bicycle-riding nun, Sister Sheila. We had not quite recovered from the shock of discovering Sister Sheila had hair when the invitation came. The nuns had recently traded in their voluminous purple habits which covered all but their faces for scaled-back white outfits that, in Sister Sheila’s case, revealed two inches of mouse-brown hair threaded with silver. Now we would find out if the nuns slept on boards and blocks of wood as we suspected, wore PJ’s, ate the host for dessert, or intoned the Gregorian chants for fun. When we arrived, Sister Sheila whisked us into the inner sanctum of the convent, her sandals clicking across the terrazzo floor. A few minutes later, Jody and I gulped a breath and poked our heads into Sister Sheila’s white-walled bedroom. A crucifix hung over the dresser, but my eyes fastened on the twin bed draped in white chenille like the too-familiar spread on my mother’s bed. chaise lounge cushions on the enclosed porch that night, we groused about not having spotted a single nun in her jammies. We plotted to take vows—once we got out of eighth grade, of course. Though I gave entering the church five minutes serious consideration in my late teens, I had “boys” tattooed across my pupils. Jody became a business woman. Neither of us ever found out what nuns wear to bed. Why did Sister Sheila’s hair jolt you into becoming a writer? Discovering that Sister Sheila had hair the year she taught me fifth grade English somehow gelled in my mind with all her positive comments on my papers. My parents’ marriage was in meltdown, and encouragement was a rare thing at home. Sister Sheila made me believe I could write. A dream was born. What do you hope your readers take away from Kicking Eternity? I hope my readers are encouraged to figure out their dreams, then courageously step into them.